Alang-gad, Madangad and Kulang-gad (अलंग, मदन, कुलंग) or AMK are considered as the toughest hill-forts in the whole Sahyadri mountain ranges. 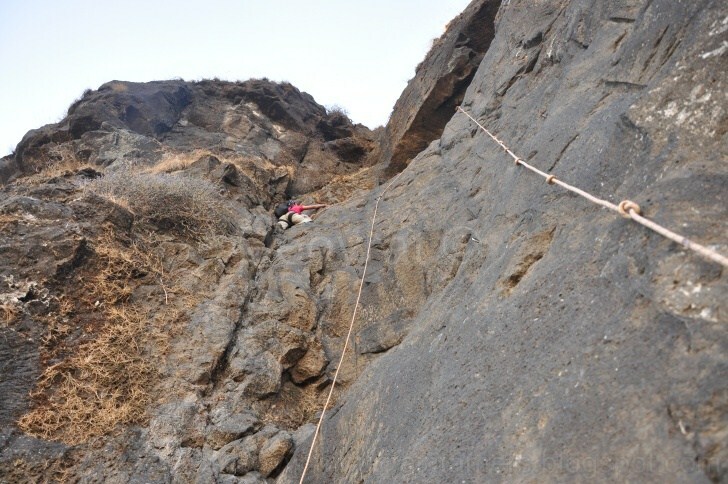 Necessary climbing skills, rope-work and working knowledge of equipment handling is required for climbing Madan and Alang forts. 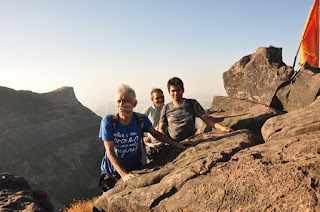 When my father plans any treks, it becomes obvious that it will span across a couple of days and the location would be in the very heart of Sahyadris. These are usually difficult treks and they are usually aimed to teach us. Being born-and-brought up in a mountaineering family, carrying 15+ kg backpack including full ration for four days was not new. We were total 6 (Papa, Aai, sister and me), papa's friend and Manoj (my friend). Manoj couldn't believe that we were doing AMK (he was brainwashed by the YouTube videos and distorted 2D images of the 3D valley, which gives a wrong perspective of the reality). Climbing in Sweden was going to help me handle the climbing part of Madangad and Alang-gad. My parents had trekked these mountains several times since past 25 years. My fathers first-ever trek was Kulang in the year 1975. AMK is not for first time trekkers or any picnic people. It is advisable to have working climbing knowledge (if not for you, its better for your teammates safety). But I am sure climbers, trekkers and even first time people will enjoy reading this article. I have tried to cover basic terminology, fundamentals here. This article is not responsible for mistakes you make. Equipment used (not everything was used, but was kept for safety reasons. This was also going to be the first time to try-out new equipment bought from Europe) 2x 50m rope, 5 QD's, 2 belay devices, descenders, carabiners, Seat-harness, helmets, extra slings of 1.5 to 2m, climbing shoes (my own use) and mittons (for rappelling down). NO JUMARS USED. 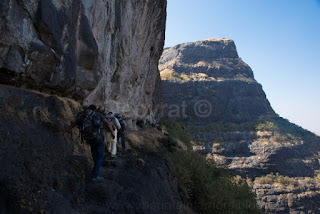 Day 1: We started on Thursday early-morning from Dadar station on-board Mahanagri Express (the same train we took while trekking to Kalsubai and Harihar forts). Train being late for 3 hrs, we reached Igatpuri station at 7 AM. 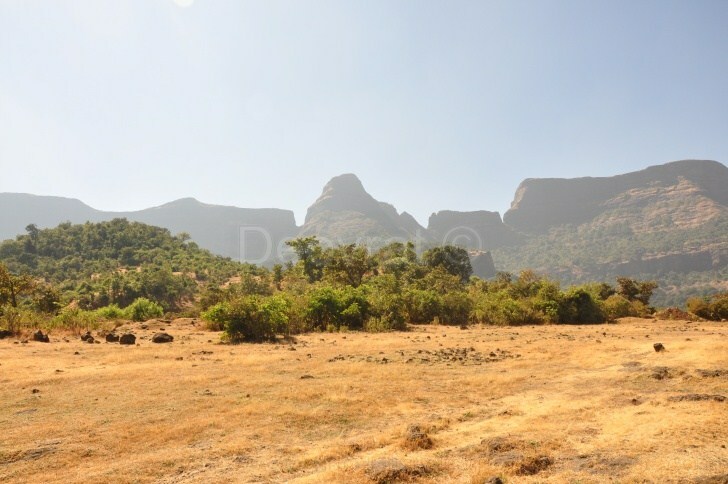 Transport to Ambewadi (the village at base of Alang fort) was arranged from Bhandardara phata, about ~15 minutes walking from Ghoti Bus stand. We had breakfast at the junction and found a jeep going to Ambewadi. Ghoti to Ambewadi took us 1 hr. 30 min. 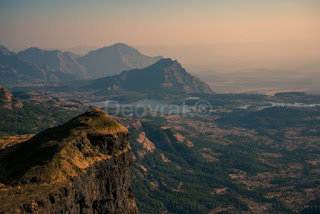 Starting with Tringalwadi fort, Alang, Madan, Kulang, Kalsubai we could spot many mountains and forts in Nashik region. Our luxurious roof-top jeep-ride added a great value to the journey. 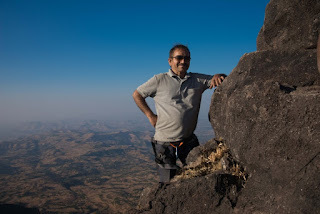 Kalsubai can be seen throughout the journey, but we are on other side of the mountain, which means, Bari, the village at base of Kalsubai, is on the other side. At Ambewadi we had one local villager with us. He packed his sleeping stuff and we left for our adventure. If you are wondering, we had our supplies and we ourselves were going to cook for our Ganpat kaka. He was not our cook nor our climber. His responsibility was to keep us on right track and on-time. The stories he told us of different groups, trekking or picnic people, were quiet entertaining. We started from Ambewadi, crossing the houses, dodging the fields, keeping Alang in front. The small hill needs to be climbed (not fully) and later traversing to Alang mountain (left to right). The stone-cut steps marks the steep climb about to follow. After 2 hours from start, the trail bifurcates, left to Alang and right to Madan. The trail to Madan is prominent and there are no sub-trails and hence no chance of losing the trail. 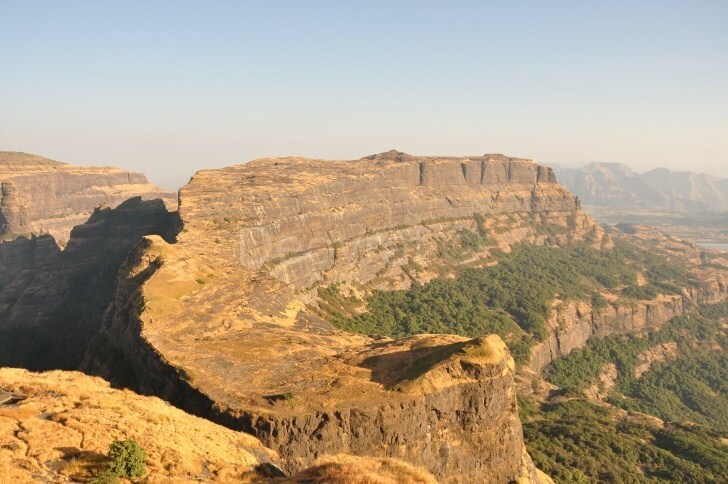 The stone-cut steps along the steep walls of the fort makes this an adventurous trek. The plan was to climb and explore Madan first and come back to Alang for the night. On the way towards Alang-Madan col, there is a wide area where we kept our heavy-luggage. We took necessary climbing equipment and some food and water with us. At the Alang-Madan col the route bifurcates and the one on right goes to Madangad. The trail is prominent and there are no sub-trails and hence no chance of losing the trail. After the col, the trail is narrow and dangerous, exposing valley on right side. We did not have to fix rope at the over-exposed traverse as there was no need for it. Everyone comfortably crossed the traverse. Still, if there be necessity of support, there are bolts fixed to attach rope (and it is recommended). This is usually the place where the picnic-obsessed, selfie-crazy people click pictures. The trail continues to traverse along the fort and stops at the foot of the rock-wall. 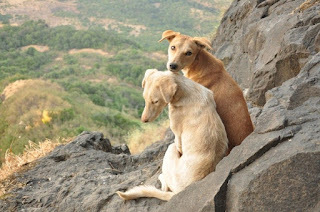 The dogs followed us till the the rock-patch. Climbing Madangad: It was my first ever lead-climbing in India on a bolted route and second overall (first was outside India, in Stockholm). The chemistry inside brain is totally different when lead-climbing and when climbing top-rope route. Also, this time, I wasn't climbing for myself but was climbing on behalf of our group, with a responsibility of rope-work. The climb was comparatively easy and was light on the arms. Climbing shoes made it even more easier. 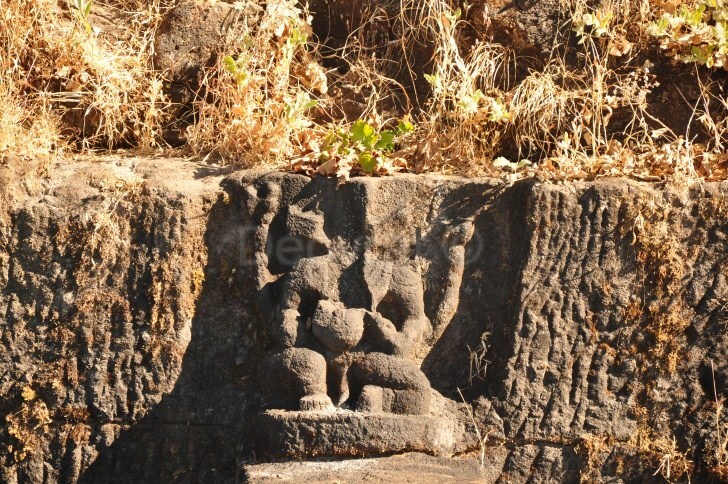 With good footholds (for toes, not flatfoot), arms were used only for maintaining balance. The rope was fixed and everyone was up the rock-wall in 30-45 minutes. Unlike others, we did not use Jumar and nobody was pulled from top. Although, additional support was provided in form of a rope to hold on to. The trail to the top is also equally exposed and needs to be crossed with caution. Some parts are exposed to valley, scree adding to its difficulty. The view of Ghatghar dam (घाटघर धरण) was a beauty. The horse-shoe shaped plateau of Alang fort could be seen from here. Some additional info- the virgin rock-wall of Alang from the Alang-Madan col was successfully climbed by Suraj Malusare in early 2016, mission led by Isolation zone under Arun Sawant sir. 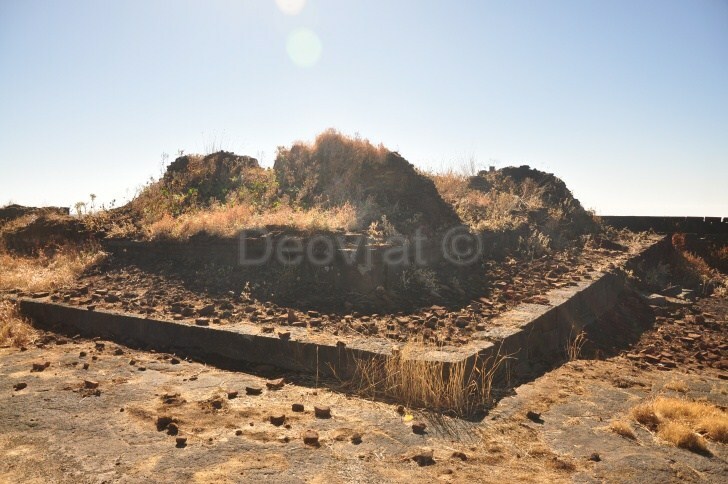 Exploring Madangad: Topmost point of Madan-fort is at an altitude of 1495 mtr from sea level. 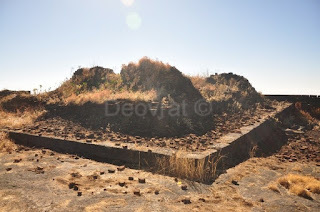 The top of Madangad is smaller in comparison to the other two forts. The water is available and the cave can be used for camping at night. The नेढ of Madangad is very famous. 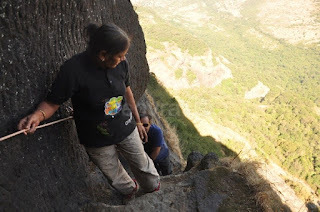 Only way to see this hole is from the base of the mountain or from the Kulang traverse. Similar, naturally formed hole in mountain can also be found at Rajgad fort, Nakhind hill, Gorakshanath hill (Manmad region near Ankai-Tankai), Ratangad, Harishchandragad. 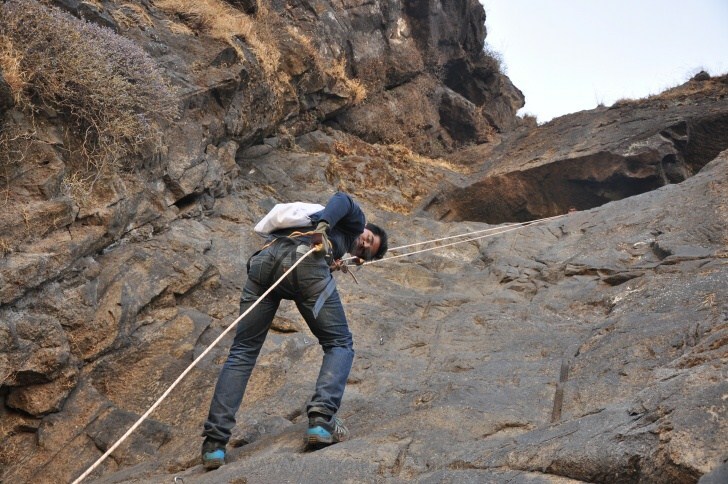 After a short water and snack break we geared-up for rappelling down rock-wall and climbing Alang. The rappelling down took us about same time, including rope-coiling and packup. 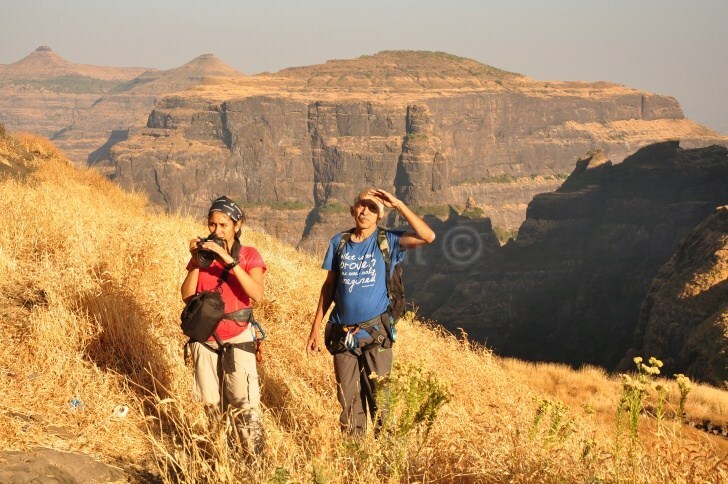 Manoj acknowledged that the traverse of Madangad was not as difficult as people portray in their photos. He added that alertness was necessary though. This is Pable kaka. We as kids, remember trekking in the forests, remote forts back then, holding on to their hands, following their footsteps.. the Bhimashankar ladder route in monsoon, Mahuli in 1st std, Manikgad in 2nd std, Chandoli treks (now banned for trekking or camping) and many more. After collecting our backpacks and repacking our climbing gear we set towards the Alang wall. So far, everything was on-track but we were slightly behind schedule. As we reached the first rock-patch of Alang-gad, it was pitch dark ~7 PM. We had to postpone our climb to Alang for next day. 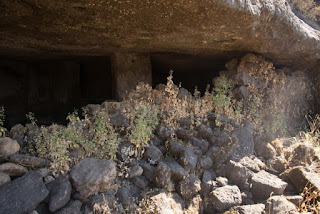 The reason why we decided that- we found a nice cozy cave to spend the night and also found a water cisterns nearby the caves. 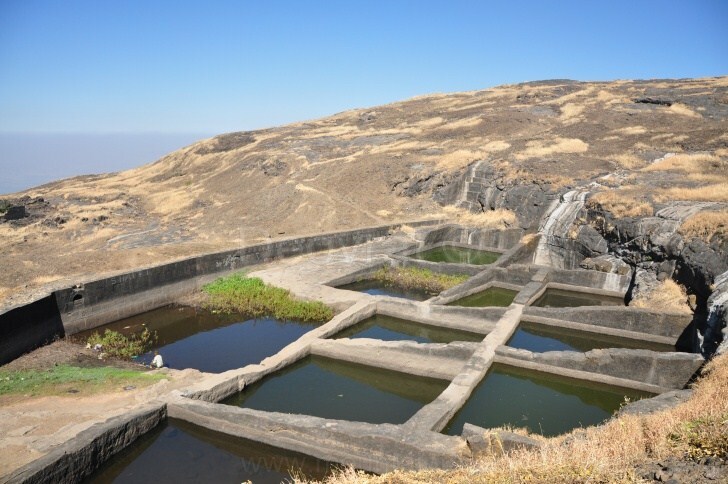 Many cisterns were filled with mud and monkey-poop in them. We used water from more clean water tank for drinking and cooking. The stove was arranged in one corner of the cave and the rest of the cave was cleaned and inspected for insects and rodents. Although there is no evidence of reptiles, some of the caves were famous for scorpions and there are photographed evidences of them. But most of them now prefer the places away from humans. Also, as per the locals, the wild-life has preferred to stay away from the main trails of AMK. As compensation for our skipped lunch, we had heavy dinner of curry-bread and rice- inside the cave, candle and torch lit room. Note: The basic rule- when you have food, shelter and water, you camp. Also, this cave is very close to the first rock-patch of Alang (the easy rock patch). Day 2: On the second day, we were up and about for climbing Alang (2 rock-patch), exploring the fort, descending the same day and reaching Kulag for the night. We took our climbing gear, necessary food and water and started the climbing part. 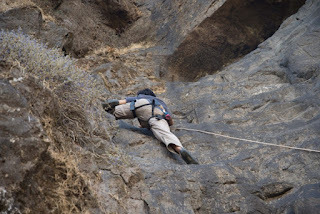 The responsibility of a lead-climber is to climb and setup the rope for rest of the team. The rope attached to lead-climbers body is not for his/her safety. Its purely a free climb and the very reason this being dangerous and should only be attempted by experts. We did not carry our backpacks and hence a lot of time and efforts were saved. 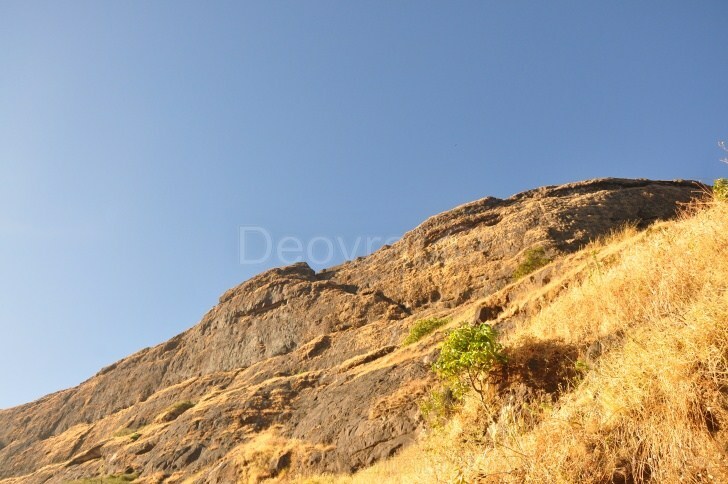 Also, due to weekdays, we did not meet any trekkers nor any paid picnickers and the walls were all to ourselves. The first rock-patch does not require much technical climbing. The bolts makes the climbing more safe and there are plenty hand-and-foot holds. My sister was asked to free climb (under supervision). Rope was set-up for safety. After this part of climb, well structured rock-cut steps takes us to the foot of 45 ft. rock-wall of Alang. The ledge is a nice resting place for others while the rope was being setup for others. This wall is also bolted and the start has good holds. It gets tricky at the top with a few easy-crimps :) I will not write how to climb and what to use and how to use. Everyone in group knew how to tie basic knots and majority of us knew how to belay. So, I will assume you also know that part (if you are a climber) and if not, don't worry. Its a right moment for you to take-up climbing lessons. I can help you hook with the right people for that (in Mumbai specifically). But now back to trek. 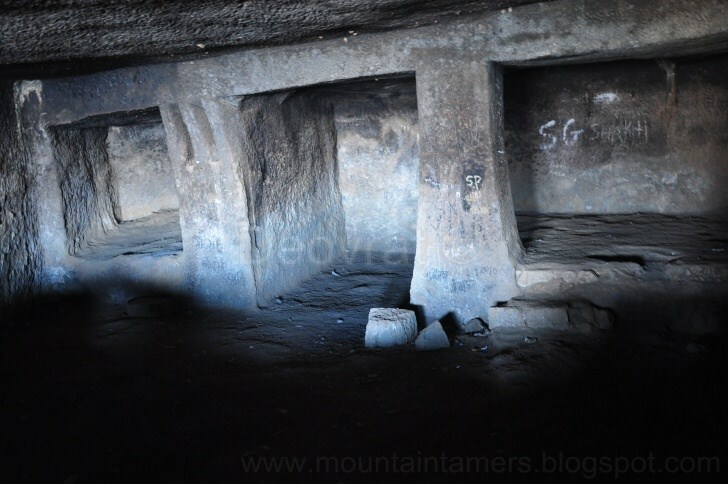 A small cave (more like a room) can be used as temporary shelter or rest point till everyone climbs-up. 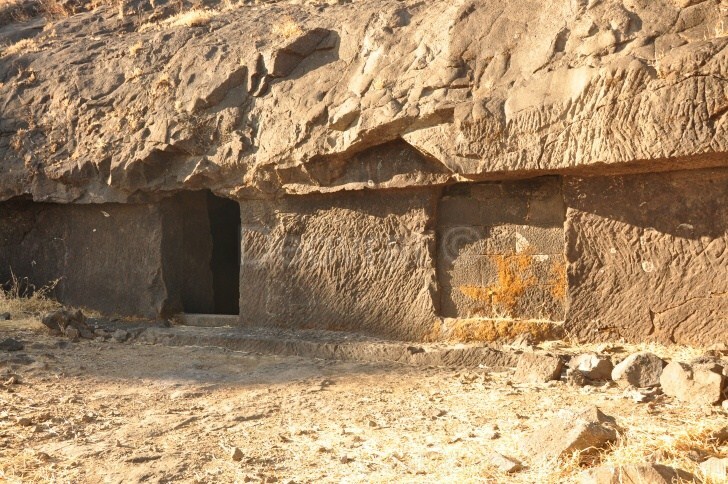 Another set of rock-cut steps, a bit more exposed to valley, finally takes us through the (collapsed) main-door of Alang fort. There are enough places to fix the rope along the steps. The steps also have handholds or small pockets (खुपण्या). Those carrying rucksacks should be extra careful. These steps takes us through a structure that resembles a broken door. 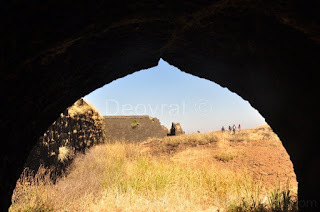 Exploring Alang: Highest point of Alang fort is at an altitude of 1375 mtr from sea level. The top of alang is a huge plateau. 3/4 hours are sufficient to explore full fort. The caves, water tank, remnants of few standing structures, an open lord Shiv temple are some of the places to visit. Towards Kulang from Alang: We started from the Alang at ~1.30 - 1.45 PM. The route circumscribes Madangad, Kulang and three pinnacles in between. At the Alang-Madan col, we took a left trail and continued along the edges of the pinnacles. After Alang, only supply of water is available at Kulang top. 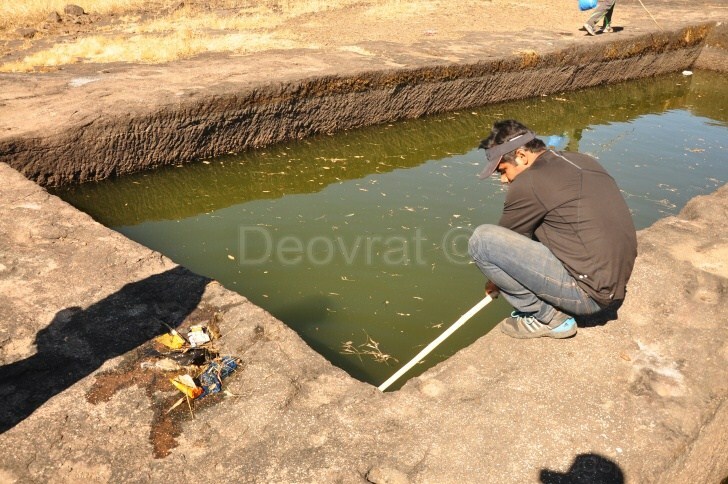 If you climb Kulang from Kulangwadi too, there is no water till you reach the top. 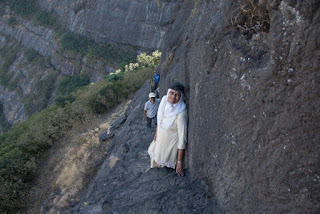 The first traverse reminded me of much easier traverse between Kalavantin-Prabalgad in Panvel. Another similarity is the bee-hives along the trail. Bees: The location of bees (as of 2017) were majorly along the cliff of Madangad, along the Kulang traverse. There are previously known cases where some picnic groups were attacked due to poor organizing by their picnic organizer (bees get easily agitated by deodorants, skin-creams, sun-screen lotions etc) Trekkers usually know how to handle such situations, so no worries. These bees were different that the normal bees. In our local Marathi language, we call them आग्या माश्या. The honey from these hives is very hot for our body. Their size is big and the sting is more painful than the sting of smaller bee. Their defense strategies are also unique. 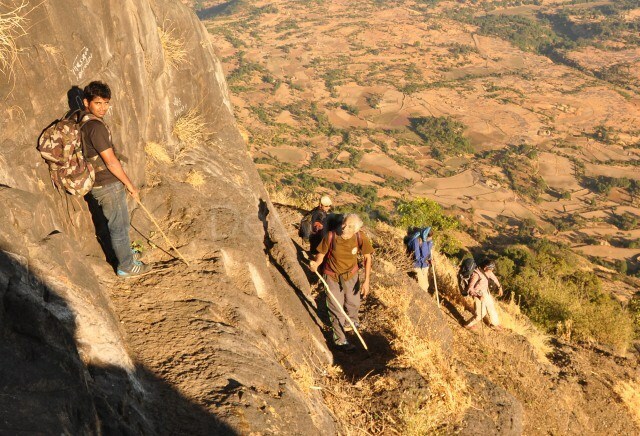 Scrambling along the slopes and traversing along the small pinnacles, trail met the mountain of Kulang. 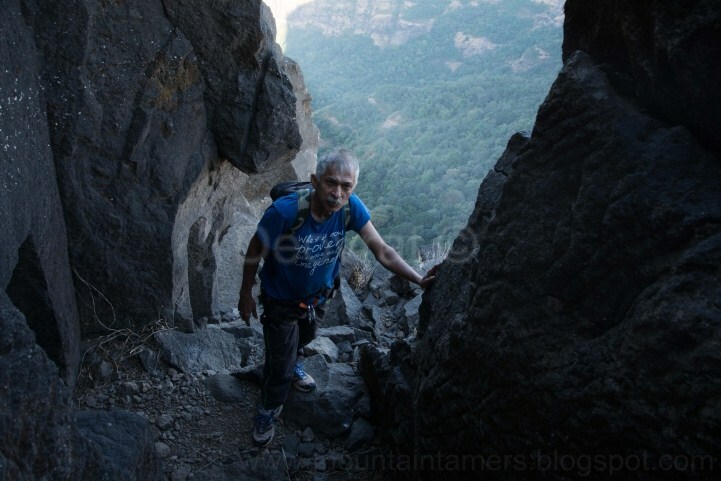 It was a heavenly feeling crossing the narrow cols between the Kulang mountain and the adjoining pinnacles. This is where Ganpat Kaka decided to leave us (we again met him after 2 days in Ambewadi at his home). 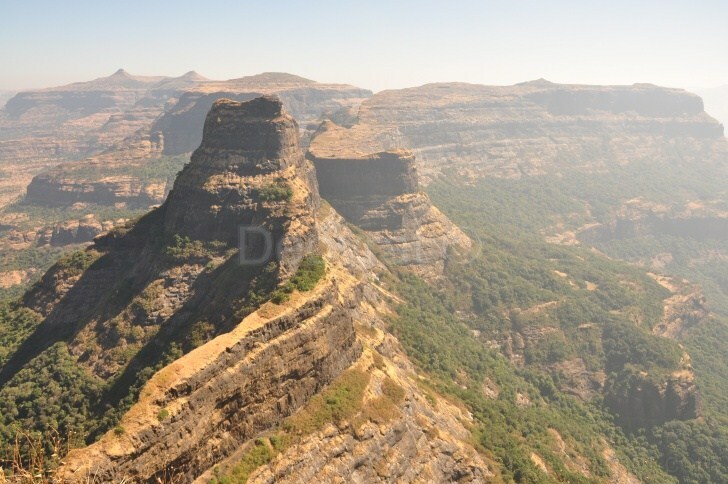 The valley gradually descends to Ambewadi. We continued along the Kulang traverse. It was roughly 5.15 PM when we reached the point (ridge) where the main Kulang trail from Kulangwadi meets this traverse from Madangad. The trail following this junction was fairly exposed and with heavy backpacks, it was utmost important to balance ourselves on the narrow edges. Route is indeed dangerous but manageable with caution. The dogs were jumping in-between our legs which was both fun and scary. With the Sun setting on the other side of the mountain, it had started to get dark. The swallows swooped pasWe were walking non-stop with the only plan to reach Kulang without using torch lights. But what seemed to be less possible looked quite doable. We entered the fort at 6.15 PM. It was again a day without proper lunch. Dinner for today was khichadi. Day 3, Exploring Kulang: Half day is sufficient to fully explore Kulang-top. The views from Kulang are classic and best among the AM and K.
We set out to explore the fort next morning after our breakfast. Kulang fact- The fort of Kulang has the highest climb from base to top among all of the Sahyadri mountains (from Kulangwadi). Highest point of Kulang fort is at the altitude of 4828 ft. or 1470 mtr. (as per barometric readings). The entrance of Kulang is still intact with the fortifications still standing along the edges of the fort. The entrance kind of serves as a division of left and right plateau of the fort. The right side houses the caves, remnants of palace, remnants of many other standing structures, few water tanks etc. The series of connected water tanks, disfigured carving of lord Ganesha, a shiv-ling, water catchment structure with gau-mukh outlet etc are on left side of the plateau. Please note that the outlet is broken off from the main structure. Day 4: We woke up early and decided to climb down before the Kulang trail got jam-packed with picnic people. Early descend also helps to avoid the overhead sun, the rock gets hot in afternoon. Slowly and cautiously, balancing our backpacks we descended the steps of Kulang fort. Our heading was Ambewadi and not Kulangwadi. A traverse breaks right towards Ambewadi (Alang direction). Note: Safety is first- be it climbing the stairs of Kulang fort or climbing the stairs of Dadar station. Having basic knowledge of climbing and safety is always helpful and the whole group benefits from it.